This post was originally published here on January 21, 2015. I’ve since made a couple small modifications to the recipe. And I’ve updated the text and photographs. Enjoy! I’m ready for a real vacation. But unfortunately, that’s not happening. 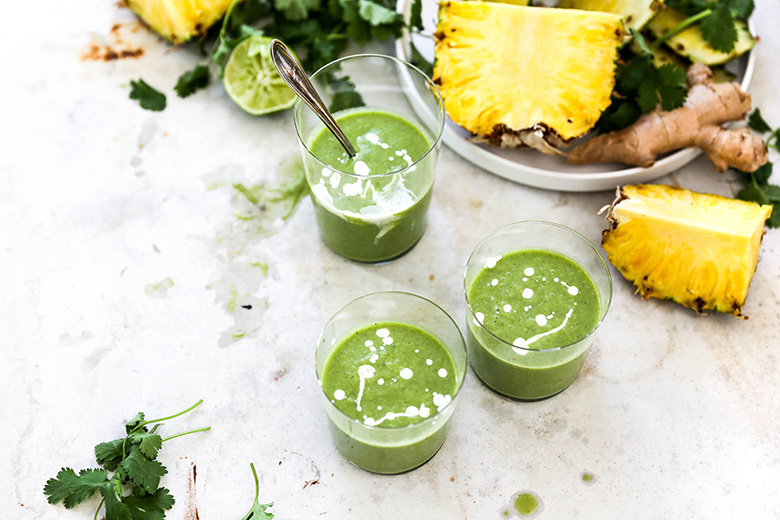 So for now, I’ll have to settle for a vacation in my kitchen in the form of one of these pretty green Tropical Cilantro Pineapple Smoothies. Mega island vibes for just a few dollars spent at the grocery store. Seems do-able. If you’re a cilantro hater, then just consider this recipe a “thank you, next”. Because there is A LOT of cilantro in these smoothies. And if you can’t handle a few sprigs on your tacos, then you definitely won’t want to be drinking one of these babies. Even I, as a bona fide cilantro lover, was skeptical at first. 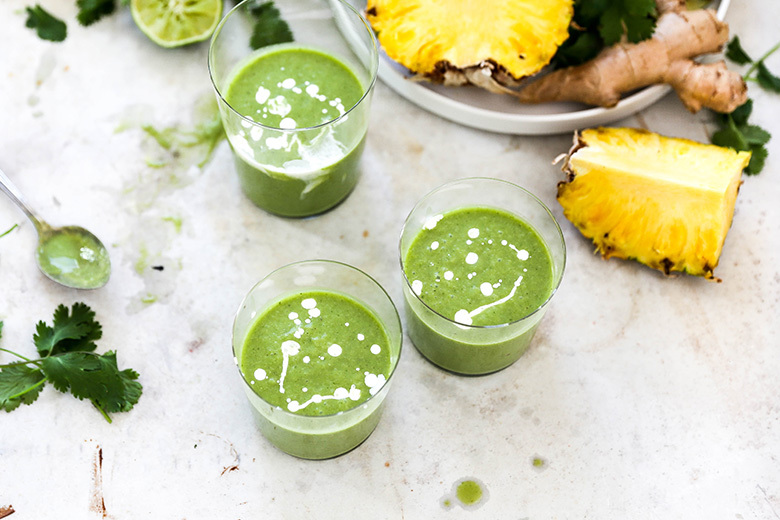 Using over a cup of cilantro for just two smoothies seemed like an awful lot. But trust me, it works. 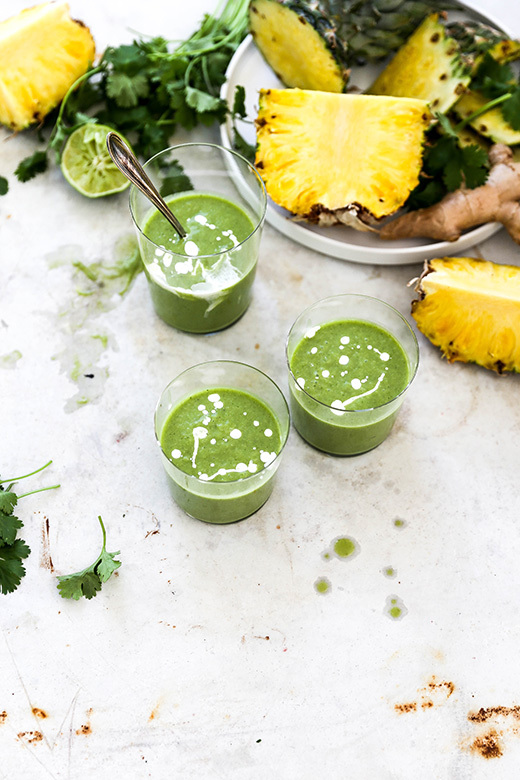 The herby-ness of the cilantro (and the zing from the fresh ginger and lime juice) is offset by the sweetness from the pineapple and banana. As with most smoothie recipes, you’ll want to use fruit that’s just at the point of being overripe. It’s your best bet for generating maximum flavor. Finding/having overripe bananas isn’t usually a problem for most people, but pineapple can be more challenging. If you can’t find a “good one” at the grocery store, you can substitute an equal amount of canned, drained pineapple in a pinch. 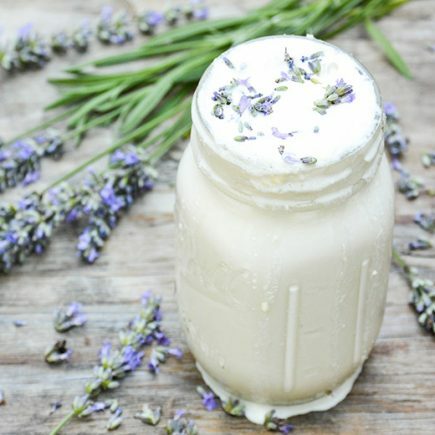 The coconut milk brings all the ingredients together into a luscious, creamy drink. And brings all those feel good tropical vibes even closer to home. Heck, you might even want to add a colorful umbrella. Or a splash of rum if it’s past noon. No judgments from me! Add all the ingredients to your blender. Blend on high until smooth. Divide the smoothie between two glasses. Enjoy immediately. Wow, a cilantro smoothie? I’m so intrigued, Liz! I would’ve never thought to add that into a smoothie. 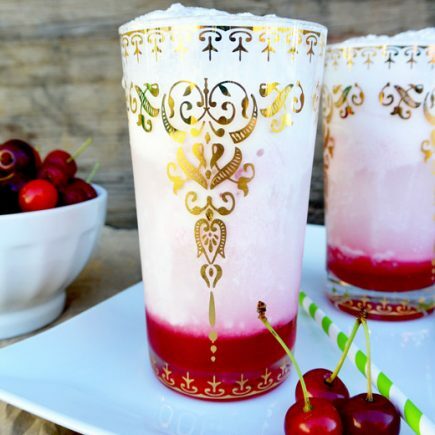 Sounds so refreshing and delicious! I know. I was skeptical. But it’s good! Let me know what you think if you try it out! Okay, you have me convinced to a cilantro smoothie!! Looks amazing! Thanks, Lauren. Glad you’re convinced! I am also a bit wary of so much cilantro in something, but as a cilantro lover if you say this is good I am going to have to try it out! Sounds so interesting + fresh! It’s is very refreshing! Let me know if you try it! I would never have thought to add cilantro to a smoothie! 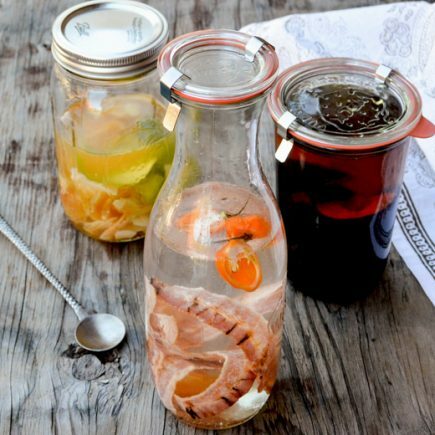 It’s one of my favorite herbs, so it makes sense that I would love it — especially with these tropical flavors! I know! Seems obvious now that I’ve done it. But it never occurred to me before. Now I’m addicted! Love all the natural flavors happening here, this looks so good! Thanks, Matt! It’s a vacation in a glass! Yeah, me neither! Green smoothie for breakfast and cake for lunch! Ha ha! I have a smoothie recipe that I use cilantro too! It’s so refreshing! I was at a whole foods and they put it in theirs, and I’ve been addicted ever since! I was surprised at how good it is. I’m totally addicted now! I know, right? It’s surprisingly good in smoothies! Totally. Smoothie for breakfast, cake for lunch. That’s my motto. Can we make t-shirts that say that?? I have a smoothie every morning and it makes a huge difference in how I feel. This looks delicious. I’ve never had cilantro in a smoothie so I’ll have to give it a try! You’re welcome, Traci! Let me know if you try it out. 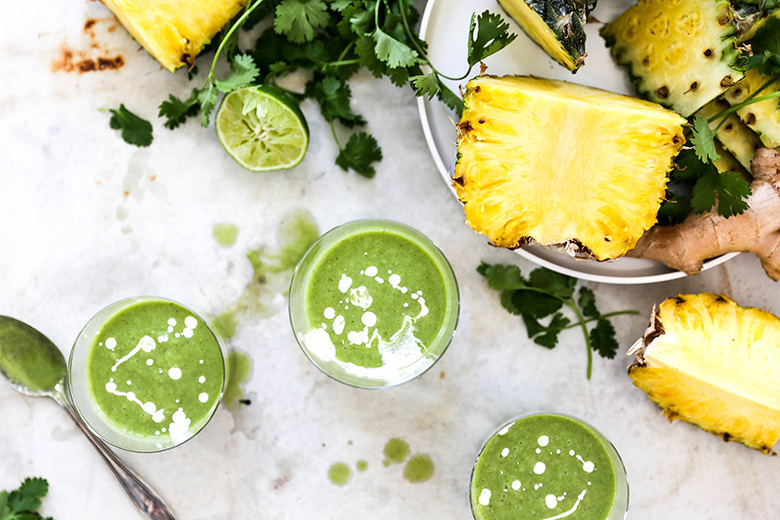 And yes, I think the cilantro and pineapple are both great for detoxifying the body. So this is really good for you, but tastes like a treat still! Thanks, Beth. I know, it seems strange. But it’s so good and I’m glad I tried it! I’m TRYING to still do the green thing, but definitely doing the booze thing, too. 😉 I’ve never put cilantro in a smoothie, but I HAVE put it in a margarita!! LOL!! I need to try it in a smoothie because this one sounds delish! I love cilantro in smoothies! But I haven’t tried combining it with coconut milk before, that’s such a good idea. I’ve gotta get my hands on the ingredients for this and fire up my blender. Thanks for the recipe! Thanks, Katie! Let me know how you like it! Woah mamma! That’s a lot of cilantro – so I know I’d LOVE it! Paired with pineapple, coconut and banana, I’m SO in! So glad you reminded me of this recipe… I need all the greens right now! It’s a fun way to get those greens! Sounds like a tropical vacation in a cup!